Odds are pretty good you have a lot of plastic eggs in your Easter supply stash. I don’t know where they all come from, but they seem to multiply like spring bunnies are supposed to. 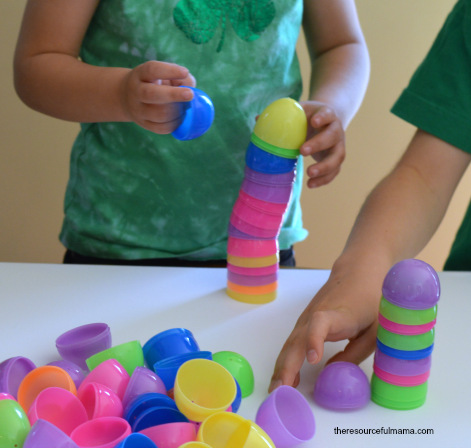 Here’s a fun game to play with those empty plastic eggs: a stacking challenge. The Resourceful Mama has all the details and ideas for how to make this more of a STEM learning opportunity and not just a contest to see which child can make the tallest tower. But even if you just build stacks of eggs, count the number of pieces used and measure the height of the tower, that’s a great activity all in itself. How do you play with plastic eggs? I’d love to hear your ideas.